Hey peeps!! I just got back from a fab weekend trip to the Ozarks in Arkansas with my mom, aunt and sister – we hit up the War Eagle Fair (with killer hand-made goodies) and Eureka Springs (a gorgeous artists’ town). I managed to restrain myself and not buy too many things! Jason sent me photos of the progress at the flip over the weekend, and I was mighty impressed – I’ll have to share them with you later. Anyhoo, the other day I was thinking about how my parents remodeled our house when I was little, and to me the highlight was the day that we got to draw on all the walls in our playroom before it was demolished. Crayons, markers, you name it we got to scribble with it. Ah, it was total heaven to get to do something that was normally forbidden! By the time we were finished it looked like a Crayola box had exploded all over the walls – it was awesome. Nothing makes you realize that you own a house like drawing on the walls! 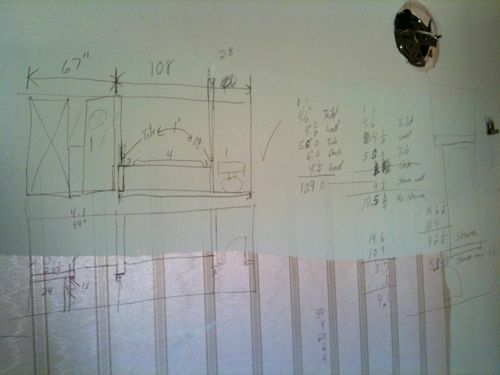 We sketched out different layouts, calculated measurements and got the whole master bath nailed down . . . on the wall. What was your ultimate “I own this home and I can do what I want” moment? It was a beautiful weekend in the Ozarks for craft fairs, to be sure! Glad you had fun here! Your story about drawing on the walls reminded me of the parties and sleepovers my parents let me have in our house when it was being renovated. They added two stories ON TOP of our little square bungalow, and my friends and I thought it was the coolest thing to be able to “walk through walls” when all that was upstairs were studs and a roof! Totally awesome Liz! Sounds like a great girls weekend too! Liz, How fun and it really takes me back to those childhood days!! Oh and I love going to the Ozarks for a getaway! I remember when we were finishing the basement, we were constantly writing our plans on the wall. After they were painted, we literally had to stop ourselves from continuing our bad habit!!! I remember when we first moved into our townhome and I painted our study red — after years of white walls that I had to leave alone because I was a renter, it was SO liberating! It’s definitely in the genes then! Long time reader, first time poster —– keep up these nice posts!